DR WHO has undergone some strange transmutations over the last 24 years but the next will surely be the strangest. The fresh-faced, clean-shaven Colin Baker will go back into his time capsule and emerge as 43-year-old Scottish actor Sylvester McCoy who started his career as a knockabout comic putting ferrets down his trousers. He was working as a box office assistant at London's Round House when they were looking for zany, off-beat actors for the Ken Campbell Road Show. The actor Brian Murphy told them to "try the guy in the box office — he's out of his head". His first show was in Strangeways gaol. From there lite show went through working men's clubs and pubs to become a cult in fringe theatre. More recently Mr McCoy has played the Shakesperian comic roles, Feste in Twelfth Night at the Leicester Haymarket, Tranio in the Taming of the Shrew, and Pompey in Antony and Cleopatra in the London Haymarket. He admits to a rebellious and slightly anarchistic streak in his character and intends to play the television lime lord with a little more zest than some of his predecessors. "It will be more humorous, I hope, but it's not going to be a comedy half-hour," he said yesterday. He prefers not to talk about his early days with the ferrets--all of 16 years ago--although he does claim that he started the craze for putting them down trousers. He is still the world record holder and he insists there is no trick. APA 6th ed. : (1987-03-03). The new Dr Who is real McCoy. The Guardian . MLA 7th ed. 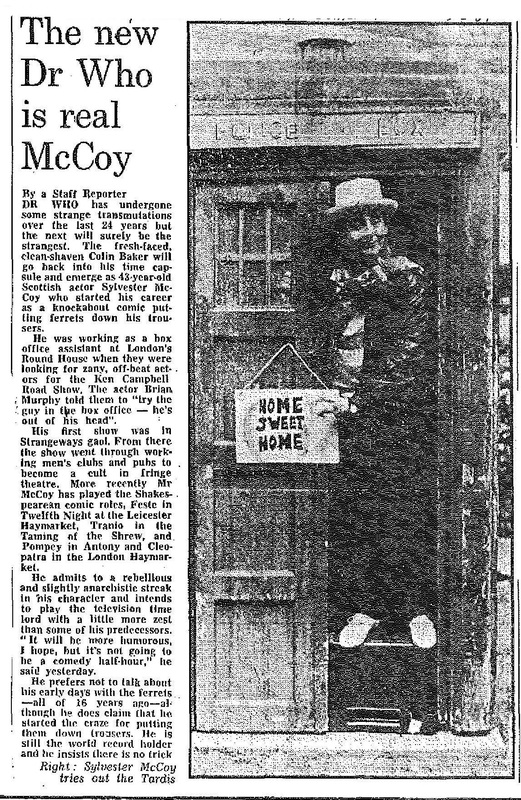 : "The new Dr Who is real McCoy." The Guardian [add city] 1987-03-03. Print. Turabian: "The new Dr Who is real McCoy." The Guardian, 1987-03-03, section, edition. This page was last modified on 19 April 2016, at 22:32.